Nanotechnology, what are you talking about? I think that most of you have heard at least once in his life the term Nanotechnology. By now it is hard to not trip over it browsing a newspaper or a monthly. We can easily catch the definition of technology by our own efforts. Technology is the application of a specific scientific knowledge with a practical purpose. So far, so good! But the prefix Nano is the one that leaves us a bit confused. It is actually much easier than you’re thinking. The prefix Nano indicates the size of the technology we're talking about. We are in front of really small size objects. Let’s try to quantify their dimension. Let’s start from a specific length unit that we know very well: the meter. 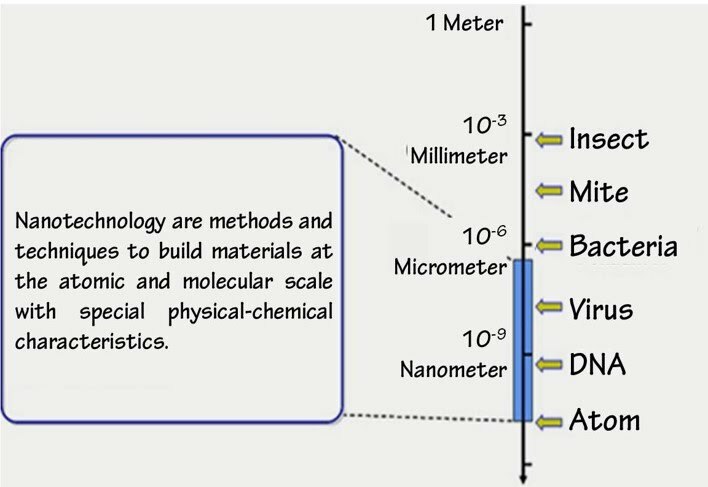 The prefix Nano indicates the term nanometer that is one-billionth of a meter. Confused? Let's play a game. Imagine the smallest thing that comes to your mind and let’s see if its size corresponds to what we're looking for. I try to guess: some of you have thought of an insect. If so, we are very far from the dimension of our interest. An insect, in fact, is about 2 billion of nanometers. A mite? We are not there yet (a mite is around 80 000 nm). You have to go down even more! A red blood cell measures between 6 and 8 micrometers that are 6 000 and 8 000 nanometers. We are still far away, but you get the right direction to go. With some viruses, such as the one that causes AIDS, you cross the threshold of the “nano-planet” and if we go even further for example with the diameter of a strand of DNA (around 2 nm): Bingo! Welcome to the invisible world of nano-objects, natural or artificial, where you are playing an important match that many consider essential to human progress.